Our own explosive Ali Smith is participating in Adam Miller’s heavy-hitting local group show opening this Saturday night at Center For The Arts Eagle Rock. Matthew Monahan, Tomory Dodge, Michael Rey, Pearl C. Hsiung, Brad Spence, lara Schnitger, Roger Herman, Erich Bollman, Annie Lapin, Kim Fisher, Josh Peters, Melise Mestayer, Ali Smith, Florian Morlat, Devon Oder, & Adam Miller. The exhibition Chasm of the Supernova takes fifteen artists and examines the implications of discordance between energetic entropy and restraint. Half of the works are reflexive ruminations on the chaotic and disruptive forces that inundate the individual’s turbulent path. While the rest of the works use gesture, color, and mark making to create anarchic compositions. Through refined, calculated, and controlled gestures, whether it’s application of paint, color choices, compositions, or pop cultural references, all of these works lead to moments of reflection and beauty among the chaos. In addition to beignets, jazz and football, New Orleans appears to have a pretty good handle on contemporary art. Concurrently on view with the “Prospect 1.5” edition of the city’s Biennial of international art, “Elements of Nature” is showcasing selections from the CA-based Frederick R. Weisman Art Foundation’s permanent collection at the Contemporary Art Center of New Orleans. On view through February 27, 2011, the exhibition features works by MMG artists Todd Hebert, Allison Schulnik, Ali Smith and Cindy Wright alongside Ed Ruscha, Robert Rauschenberg, Billy Al Bengston and many others. More information on the show – curated by Billie Milam Weisman – can be found on the exhibition website. MMG’s Ali Smith and Ben Weiner will be featured in “Elements of Nature: Selections from the Wesiman Foundation,” alongside Charles Arnoldi, Billy Al Bengston, Vija Celmins, Joe Goode and Ed Ruscha – opening tonight (March 13th, 2010) at the Carnegie Art Museum in Oxnard, CA. From 4-6pm, you can meet some of the artists featured in the exhibition, and preview the show, which will be on view through May 23, 2010. For more information, you may visit the Carnegie’s website. As we dust ourselves off from the NYC fair madness, catch up on our sleep and prepare for installation week, we came across a couple noteworthy tidbits that highlight our experience at PULSE Contemporary Art Fair this year. ArtInfo‘s Amber Vilas wrote a thorough wrap-up of PULSE’s run, including a prominent feature on MMG’s solo booth of works by Kim Dorland and special public installation by Tim Bavington. She also made mention of Dorland’s paintings at Mike Weiss Gallery, who exhibited at Scope this year, and Ali Smith, who showed at Freight + Volume. Read her full article here! Additionally, ArtLog hosted a poll for readers to vote for their favorite booths at each fair during Armory Week. We’re pleased to announce that MMG snagged first place for PULSE! Check out the results of our fair, and others, here! More to follow soon…in the meantime, make a note to come to Kim Dorland’s opening reception at MMG on March 20, from 5-7pm! Perfect opportunity to make it up to yourself in case you missed his works in NYC. 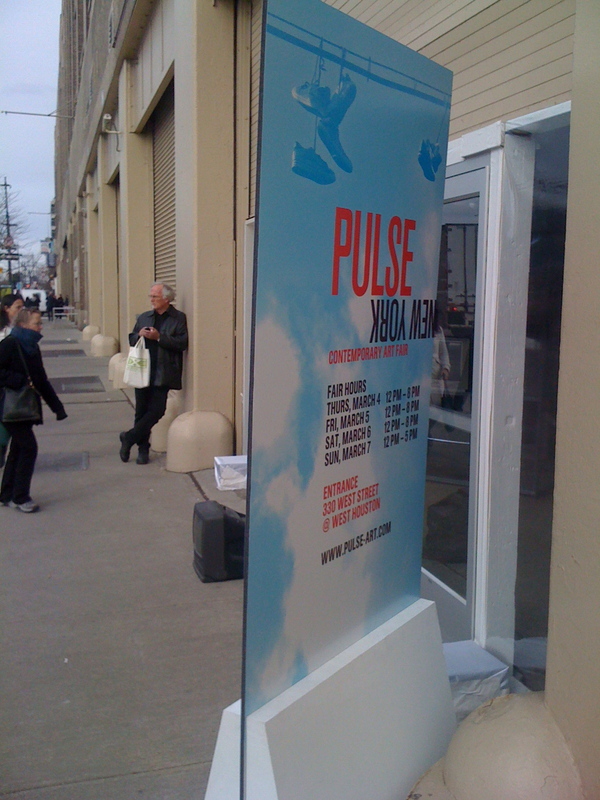 After seven days in the Big Apple, MMG can officially dub PULSE NY 2010 a success. Our days were peppered with finicky heaters, tinkling gelato carts and hundreds of pounds of oil paint (literally) – not to mention TMZ-worthy celebuzz and waning cell phone reception in the concrete bunker that is 330 West Street. Kim Dorland churned out what was easily the most “hold-up-omg-is-that-all-paint? !” collection of works to date. With a solo show in Santa Monica just on the heels of his solo booth (opening March 20th), we can safely assume prolific tendencies are not an issue when it comes to him. Kim assured us we would be delivered a show-stopper, and show-stopper it was…also a spine-stopper as the focal point of the booth, “Star Gazing,” weighed over 250 pounds. Kim – clearly – has a sharp sense of humor, but with seven paintings finding homes in excellent collections, we will allow him to continue with his gluttonous oil-and-acrylic shenanigans. A special public installation by Tim Bavington garnered quite a bit of attention as well. Between the Vegas-strip-esque striped wallpaper and amorphous paintings, the corridor between the entrance and the coat check was transformed into a vibrating optical rabbit hole. Four of these studio-fresh works found homes on just Day One of the fair. In the few minutes that the MMG crew had to stray away from the confines our our booth, we saw a few familiar faces (so to speak): Ali Smith and Kenichi Yokono in Freight + Volume’s booth, as well as new works by David Ryan and Kiel Johnson with Davidson Contemporary looked uber-fabulous, and ultimately found their way into some choice collections. – Dinner with Yigal Ozeri and the crew from Mike Weiss Gallery included meeting Jessica from “Jessica with Vines” – a featured painting at PULSE Miami this past December. Turns out Yigal’s accuracy is staggering, as is the length of Jessica’s strawberry-hued hair. – Guest appearances by Dimitri Kozyrev, David Ryan, Ben Weiner and Kim Dorland – with his family in tow. – A brief foray into the Armory Show, where DCKT’s solo booth of new works by Cordy Ryman prompted much drooling and jaw-dropping. So much so, that owner Mark Moore practically barreled over Bjork in an effort to make it back to the booth for a second viewing. All in all, we suspect we’ll be back next year – hopefully without Jay-Z’s “Empire State of Mind” on repeat in our brains. Adios, NYC. Love ya, mean it, kiss, kiss. Kim Dorland’s “Star Gazer”….like most good things in life…difficult…. Perfect for the whole living room, yes? If you’re in the Orange County/Southern California area, better swing by the Laguna Art Museum for their current exhibition, “The OsCene: Contemporary Art and Culture in OC,” featuring MMG artists Nobuhito Nishigawara and Ali Smith, alongside artists like Ryan Callis, Kendell Carter, Virginia Katz and Noah Thomas. The show will be on view through May 16, 2010. 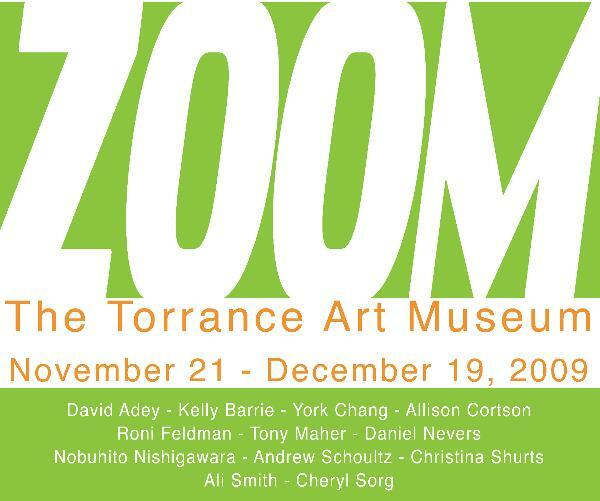 MMG’s Ali Smith and Nobuhito Nishigawara will be featured in Torrance Art Museum’s ZOOM, an open-call juried survey of current developments in contemporary artistic practices from regional states. Also featuring David Adey, Kelly Barrie, York Chang, Allison Cortson, Roni Feldman, Tony Maher, Daniel Nevers, Andrew Schoultz, Christina Shurts and Cheryl Sorg, the exhibition will be on view November 21 – December 19, 2009. For more information, visit TAM’s website.